It’s time for an update on how last year’s PPC reclamation project is going. If you want the TL;DR version: quite well, I’d say. Summary: Traffic to my wife’s website is up, PPC clicks are up, cost-per-click is down, and she’s attracting visitors for a much bigger variety of keywords than before. We’re attracting more online leads and she’s been busier than I can remember over the past 6-9 months. If you want the longer version….read along. I’m not a PPC guy. Don’t know it. Don’t like it. And yet, I’ve been “managing” (using the term very loosely) an AdWords account for my wife’s real estate business for the past 6-7 years. Last summer, my friend Todd Mintz (who works at PPC Associates) agreed to take on my PPC reclamation project — to cleanup the account on my behalf as an experiment of sorts. He began that in July and within the first month had written a couple articles with lessons from what he saw in our account and how he was fixing things. I remember Todd suggesting we might want to increase our daily budget a bit, which we did. But it’s still a pretty frugal PPC account, in my opinion. Then life got in the way a bit. Plans to upgrade Cari’s website got put off because we suddenly decided to buy and build a new house. The website upgrade finally happened in January of this year. We added a full-fledged Tri-Cities MLS search engine, complete with indexable property pages, lead generation capabilities and more. It’s not the prettiest system out there, but it’s working well. One of the things I wanted to upgrade to help the PPC account was the various landing pages we were using. Previously, those pages were just generic text about the different local towns in our area. Now, most of those pages have current homes for sale — like the Richland Real Estate page, for example. My assumption is that improving the landing pages would help with Quality Score … but again, I’m not a PPC expert so who knows? He calls it “metricless” PPC management because in small-town real estate, you don’t have the luxury of tracking every click through a phone-tracking system or some other lead-gen process to see how searchers progress through a sales funnel. Add in the fact that, when Cari asks clients how they found her, “The internet” is about as specific as most can tell her. Was it a PPC ad? Her Facebook page? Organic search results? A blog post? It’s all very fuzzy. But there are some metrics we can look at, and that’s what I’ve done recently. This first graph is AdWords-only traffic going back to last summer, before Todd optimized the account. As you can see, we were getting some paid Google traffic before Todd got involved, but there was an immediate jump after he edited what we were doing in AdWords. And then, when we also upgraded the website with better landing pages and content, PPC traffic climbed to another level. And it’s been steady the past few months. I think this is awesome. Since Todd audited and cleaned up the AdWords account last July, clicks have gone way up while the average cost-per-click went way down. And that average CPC stayed down in January when we redid the website and clicks increased even higher. So, if I’m understanding this correctly, we’re getting more PPC traffic/clicks and spending less, on average, for those clicks. That’s good, isn’t it? And really, the ultimate metric is clients/income/etc. Without giving away too much personal info, I can say that Cari’s had an excellent run over the past 6-9 months and she currently has more listings for sale than she’s ever had. People consistently say they find her via the Internet, and the website upgrades have led to several online leads. All in all, with a huge thanks to Todd, I’d say the PPC reclamation project has been a great success. 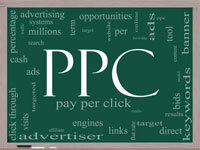 And if you’re in need of PPC help, get in touch with him via PPC Associates.